Habit: Annual to small tree; monoecious. Leaf: simple, opposite or alternate, generally petioled, entire to 1--4-pinnately lobed or divided, distal-most often reduced, bract-like. Inflorescence: staminate heads and pistillate heads together in distal leaf axils or in terminal, spike-like clusters, or staminate heads in spike- or raceme-like clusters distal to pistillate heads; staminate involucre +- cup-shaped, phyllaries in 1 series, +- fused, receptacle flat or rounded, paleate; pistillate phyllaries 0 or few, in 1 series, free, +- thin, receptacle paleate, palea bases fused, becoming a hard bur with each pistillate flower in a separate chamber, tips (occasionally not evident in flower heads) becoming hard knobs, spines, or scarious wings. Staminate Flower: 3--many; corolla translucent to yellow or red-purple; filaments fused, anthers free; style unbranched, ovary vestigial, pappus 0. Pistillate Flower: 1--5; corolla 0; style branches elongated. Fruit: inside bur with beak(s) surrounding style(s); pappus 0. Species In Genus: 45--50 species: native to America, especially southwestern United States, northern Mexico. Etymology: (Greek: early name for aromatic plants; mythic food of the gods) Note: Wind-blown pollen often allergenic. Unabridged Note: Spines of bur derived from paleae, not phyllaries. Habit: Shrub 2--9 dm, rounded, much-branched; herbage softly canescent-strigose. Stem: stiff. Leaf: sessile or petiole to +- 1 cm; blade 0.5--4 cm, +- ovate, 1--3 × pinnately lobed or divided. Inflorescence: staminate and pistillate heads mixed along axis of spike- or raceme-like cluster; staminate heads 3--5 mm diam, phyllaries 5--8, canescent; pistillate heads 2-flowered. Fruit: bur 4--9 mm, +- spheric, golden to purple or brown, puberulent; spines 12--35, 2--4 mm, spiraled, flat, straight, sharp. Chromosomes: 2n=36,72,108,126,144. Ecology: Creosote-bush scrub; Elevation: -80--1700 m. Bioregional Distribution: s SNE, W&I, D; Distribution Outside California: to southwestern Utah, Arizona, northwestern Mexico. Flowering Time: Dec--Jun Note: Hybridizes with A. salsola. 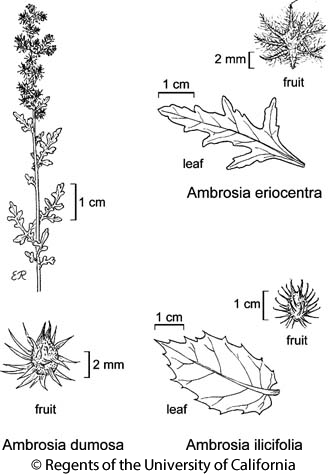 Citation for this treatment: David J. Keil 2012, Ambrosia dumosa, in Jepson Flora Project (eds.) Jepson eFlora, http://ucjeps.berkeley.edu/eflora/eflora_display.php?tid=823, accessed on April 19, 2019.
s SNE, W&I, D; Markers link to CCH specimen records. Yellow markers indicate records that may provide evidence for eFlora range revision or may have georeferencing or identification issues. Purple markers indicate specimens collected from a garden, greenhouse, or other non-wild location.